You’re the only person in your profession who has won the highest award given to your level of employee in consecutive years. You were named the 100th most influential personality in your profession. You were leading your profession’s most historic group the last time they were tops in their field. Your duties in your position included studying reports on competitors. You’ve had to negotiate contractual situations. You can not read or write. Correct, you are a functioning illiterate. THE COUCH will be hearing from our guests who come from north of our border telling us that this is old news, and maybe it is…but what they hey! Jacques Demers was a coach in the National Hockey League from 1977 – 1999. In 2005, he released a biography written by Mario Leclerc, titled En toutes lettres (All Spelled Out in English). THE COUCH thinks this is fascinating. Mr. Demers is currently a commentator with the French Canadian sports network RDS. Even in this position, his peers have piles of notes to refer to during the broadcasts. In 1998 Demers was Coach and General Manager of the Tampa Bay Lightening. He brought in Cliff Fletcher and Jay Feaster as assistants to handle contracts he couldn't read. "I never really was a GM," he said. "I hired Cliff Fletcher and Jay Feaster because I knew I couldn't do that." Before he married his wife Debbie, they were living together. One day after Jacques had put off paying bills; he finally broke down and told her of his secret. In the book, Demers discusses how he grew up in an abusive home where his father beat him and his mother. Demers says he never to learn how to read in write in school because “I had so much of a problem with anxiety because of the things going on in the family. I couldn't go to sleep at night. I'd go to school and I couldn't learn anything." Demers is also quoted as saying "I have no problem saying what I wanted to say. That's what I needed," he said. "I've been carrying this all my life. I succeeded, and I'm telling people 'you're capable of doing something in your life even if you have some big handicaps.' "
This weekend, we turned on ESPN and caught this story after it began. When we looked for information it surprised us that the book had been out over a year. THE COUCH wishes we heard more of these sports stories and less of the drugs and guns and wife beating stories from sports. Have you heard the story of the woman who walked out of the woods in Cambodia after disappearing 19 years ago? A family has immediately claimed she is their daughter who went missing while watching a water buffalo. "I dare anyone to wager 10,000 dollars if they think she is not my daughter," challenged Sal Lou, a policeman in this isolated village who said he immediately recognized his child by an old scar when she was brought naked and dirty from the jungle 10 days ago. When Rochom P'ngieng was caught she was naked and hunched over like a monkey scavenging for rice at a farm near to the village she was brought to. There Sal Lou and his family said she was a member of their family; that they recognized her from an old scar. The woman does not speak, only stares at the ground as the throngs of people come to stare at her. They watch her sleep and get fed by Sal Lou’s wife Rochom Soy. 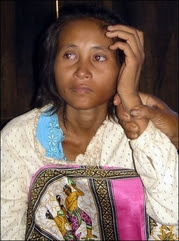 Though she has tried to escape a few times and in the process tearing off her clothes there appears to be some doubt that this woman had been in the jungle for 19 years. Her hands and feet are remarkably smooth, her nails trimmed and her hair is not matted. Additionally, there are marks on her wrists that indicate she has been bound for long periods of time. She has been communicating with grunts and gurgles along with hand gestures. According to Sal Lou she has begun to understand the language of her village, understand the simple commands they give her. The jungles of Ratanakkiri -- some of the most isolated and wild in Cambodia -- are known to have held hidden groups of hill tribes in the recent past. In November 2004, 34 people from four hill tribe families emerged from the dense forest where they had fled in 1979 after the fall of the genocidal Khmer Rouge regime, which they had supported. MIDWEEK MUSICAL MEME TOMORROW... Come on out and take a guess. We will be posting at 9:00AM Central Time to give others a chance. A long time ago I had a client who had been four years at a decent college here(NOT UK) who could not read or write. Of course he could block shots. I also recently helped a woman who had been taken advantage of by an unseemly person who sold her all the wrong forms to get her divorce because she could not read or write. She hugged me like I ws her long lost daughter when I got her case finished. It's one of the saddest things I know---folks not being able to read. We do have a great program here to help at the Carnegie Literacy Center. Nice post Bondbaby--glad you are listening to those Canucks. Smooch! You've been TAGGED with "The 25 Question Meme!" My word what a story, 19 years! Must be so confusing for her, I can't even imagine...the whole story fascinated me Bond baby, thanks for posting it. That being said, once he got out of his abusive home and moving on with his life, why did he not learn to read? I don't think it is a good message that people can succced by "just getting by" or by hiring people to do their work. Especially reading. I think the message would have been a better one if he had said, "I did this without being able to read and now that I'm in a better place, I'm going to overcome that hurdle too." I had never heard about Jacques Demers (shame on me). Very interesting. It's amazing what a person can overcome if they have the determination. TISHA: My pleasure darling... we like to inform as well as amuse. MAGS: He is now trying to learn to read and write. There is so much shame involved with this that i think it is difficult, once you move into the real world, to stand up and acknowledge your situation. I saw a piece about Demers on ESPN just yesterday...Quite interesting. Now if only GW had the guts to admit that he cant read or write!! wow, very interesting read, thanks. Seriously, I knew about him, but not all the details. And that is a very interesting story out of Cambodia. Thank you for, as always, enlightening us. I can't wait to read Jungle Woman's book. Lol...apparantly now...you've been tagged twice. TWYLA: And you, my dear, know much i do not, which is why we enjoy each other's posts. I work daily with struggling readers. Whatever we imagine it to be like to be a non-reader, it can only be worse in reality. A child who can't read is confused, embittered, self-flagellating, defensive. A teen who can't read is isolated, fearful, resistant, self-abasing. Where does the system go wrong, that so many do not read? It breaks my heart to see so many students who possess the expectation of failure for what, for most of us, is a basic skill. The real tragedy is that the situation is not improving, despite our best efforts. At the beginning of this school year, I was given the task of implementing a reader's workshop for a group of 15-year old kids (the "juvies"). These are students who are considered to be at risk for dropping out of school. The common denominator? They couldn't read. I started out the sememster with a huge chip on my shoulder about this concept. I'm the freakin' music teacher here. Why saddle me with a modified English course for the worst actors in the school? Don't get me wrong. I like these kids. In small doses. Preferably one-on-one. They have all taken my music courses. They all drop in at noon and after school for little chats with me. I am familiar with them. And I know their roots. Which are all the reasons (huge sigh of resignation) why I was selected to animate this class. First thing, I had them complete a survey. Simple enough, really. They were given a rubric page to complete as I read questions prepared by the province. The rubric ranged from 1 - 5, low being a negative comment and high being positive. From this, I learned some basic truths. There is little, if any, reading material (books, magazines, newspapers) in their homes. The parents do not read. Television is central to their lifestyle. The parents did not read to their children when they were young, and did not emphasize academic progress when they reached school age. Most of these kids admitted to being put through grade after grade at school, even though they hadn't mastered the basics. That means that, although they probably could recite the alphabet in grade one, they couldn't identify either the representative symbols, or the sounds associated with each letter. This is a necessary step in the literacy process. Tragically, some of my grade ten students were still unable to sound out words without prompting. We spent a month doing intensive remedial work, during which time, I dealt as much with discipline issues as I did with teaching. Every day, I read to these kids. Every day, they had to read to me. Each week, I recorded them (benefit of teaching the class in the music room). At the end of each month, they listened to themselves and we discussed their progress. Gradually, the focus in the class shifted from classroom management to reading. These kids were starved for the kind of attention I gave them. They sat, rapt, each day as I read to them from increasingly complex novels. The story was the thing. Well, and perhaps the fact that I use "voices" (hangover effect from having a small child at home) to personalize the individual characters. Lois Lowry, James Patterson, George Orwell ... and gradually, over the course of the semester, most of them began to seek out novels that interested them, and read them in class. There are a few holdouts in the reading workshop: kids who will never choose to read. But even those can honestly admit to having shown improvement over the past months. They are proud of their achievements, and the outcomes are even more far-reaching than I had originally expected, in the form of fewer discipline problems in other classes, higher academic achievement across the board (well, I expected that). Even the family homes have been affected by the kids' achievements. Most surprising? Parental support for academics was way up. Books were appearing in the homes. Some of the kids were even reading, instead of watching TV after supper. At parent-teacher meetings, I had a higher percentage of parents from this group show up than was usual. One parent confessed to me that she was reading her son's novel after he went to bed. A father complained that he used to have to pry his son off the internet to get him to go to bed. Now, he didn't know what to do, because the "damned kid" was reading, and he didn't want to discourage it. One Mom and Dad team celebrated their daughter's achievements by taking her out to dinner each time she completed a novel. The key here? This young lady had NEVER read a complete novel by herself before in her life, and now she's read five! Even better than that, this family hadn't spent quality time together in over ten years - since before she started school. And in December, I had a most memorable encounter at the grocery store. The mother of one of my most reluctant students approached me to tell me that her son had requested a particular BOOK as a gift for Christmas. We both had tears in our eyes by the end of the conversation. As I mentioned before, although not every student reached such spectacular heights, all showed improvement in their ability to decode written words. I am very proud of my kids because they faced their fears and made changes that will impact the rest of their lives. Jacques Demers spent his career dodging and making accomodations for his inability to read. He is revered for what he accomplished in his career, not for what he couldn't do. Nevertheless, why did he wait so long to remedy the situation for himself? I have talked to my students about this, and I sure hope they bought into my explanation. So many non-readers think they can't read because they are "too stupid". There's the true tragedy in this. The truth is, most non-readers are so intelligent, they are able to disguise their inability to read from the rest of the world. They develop skills to help them compensate. Jacques Demers was able to excel in a highly competitive field despite the fact that he couldn't read. Few of his colleagues knew of his disability. Yet, despite his success, he still thought that learning to read was something he could not achieve. It was his "embarrassing secret". For a man as great and successful as Demers, it's unimaginable that he would live with this insecurity for so many years. I find much to admire in a man who would, post-retirement, finally come forward and seek help. Not only did he achieve greatness in his career, he also has the ability to become a role model and spokesperson for literacy. THE FOLLOWING POST IS BEING MADE BY OUR FRIEND COCO. WHEN IT CAME TO ME IT WAS ONE LONG PARAGRAPH AND I WANTED TO ENSURE IT WAS READABLE FOR ALL. Coco - excellent excellent points- thanks! I work daily with struggling readers. Whatever we imagine it to be like to be a non-reader, it can only be worse in reality. A child who can't read is confused, embittered, self-flagellating, defensive. A teen who can't read is isolated, fearful, resistant, self-abasing. Where does the system go wrong, that so many do not read? It breaks my heart to see so many students who possess the expectation of failure for what, for most of us, is a basic skill. The real tragedy is that the situation is not improving, despite our best efforts. At the beginning of this school year, I was given the task of implementing a reader's workshop for a group of 15-year old kids (the "juvies"). These are students who are considered to be at risk for dropping out of school. The common denominator? They couldn't read. I started out the semester with a huge chip on my shoulder about this concept. I'm the freakin' music teacher here. Why saddle me with a modified English course for the worst actors in the school? Don't get me wrong. I like these kids. In small doses. Preferably one-on-one. They have all taken my music courses. They all drop in at noon and after school for little chats with me. I am familiar with them. And I know their roots. Which are all the reasons (huge sigh of resignation) why I was selected to animate this class. First thing, I had them complete a survey. Simple enough, really. They were given a rubric page to complete as I read questions prepared by the province. The rubric ranged from 1 - 5, low being a negative comment and high being positive. From this, I learned some basic truths. There is little, if any, reading material (books, magazines, newspapers) in their homes. The parents do not read. Television is central to their lifestyle. The parents did not read to their children when they were young, and did not emphasize academic progress when they reached school age. Most of these kids admitted to being put through grade after grade at school, even though they hadn't mastered the basics. That means that, although they probably could recite the alphabet in grade one, they couldn't identify either the representative symbols, or the sounds associated with each letter. This is a necessary step in the literacy process. Tragically, some of my grade ten students were still unable to sound out words without prompting. We spent a month doing intensive remedial work, during which time, I dealt as much with discipline issues as I did with teaching. Every day, I read to these kids. Every day, they had to read to me. Each week, I recorded them (benefit of teaching the class in the music room). At the end of each month, they listened to themselves and we discussed their progress. Gradually, the focus in the class shifted from classroom management to reading. These kids were starved for the kind of attention I gave them. They sat, rapt, each day as I read to them from increasingly complex novels. The story was the thing. Well, and perhaps the fact that I use "voices" (hangover effect from having a small child at home) to personalize the individual characters. Lois Lowry, James Patterson, George Orwell ... and gradually, over the course of the semester, most of them began to seek out novels that interested them, and read them in class. Even the family homes have been affected by the kids' achievements. Most surprising? Parental support for academics was way up. Books were appearing in the homes. Some of the kids were even reading, instead of watching TV after supper. At parent-teacher meetings, I had a higher percentage of parents from this group show up than was usual. One parent confessed to me that she was reading her son's novel after he went to bed. A father complained that he used to have to pry his son off the internet to get him to go to bed. Now, he didn't know what to do, because the "damned kid" was reading, and he didn't want to discourage it. One Mom and Dad team celebrated their daughter's achievements by taking her out to dinner each time she completed a novel. The key here? This young lady had NEVER read a complete novel by herself before in her life, and now she's read five! Even better than that, this family hadn't spent quality time together in over ten years - since before she started school. And in December, I had a most memorable encounter at the grocery store. The mother of one of my most reluctant students approached me to tell me that her son had requested a particular BOOK as a gift for Christmas. We both had tears in our eyes by the end of the conversation. As I mentioned before, although not every student reached such spectacular heights, all showed improvement in their ability to decode written words. I am very proud of my kids because they faced their fears and made changes that will impact the rest of their lives. Jacques Demers spent his career dodging and making accommodations for his inability to read. He is revered for what he accomplished in his career, not for what he couldn't do. Nevertheless, why did he wait so long to remedy the situation for himself? I have talked to my students about this, and I sure hope they bought into my explanation. So many non-readers think they can't read because they are "too stupid". There's the true tragedy in this. The truth is, most non-readers are so intelligent, they are able to disguise their inability to read from the rest of the world. They develop skills to help them compensate. Jacques Demers was able to excel in a highly competitive field despite the fact that he couldn't read. Few of his colleagues knew of his disability. Yet, despite his success, he still thought that learning to read was something he could not achieve. It was his "embarrassing secret". For a man as great and successful as Demers, it's unimaginable that he would live with this insecurity for so many years. I find much to admire in a man who would, post-retirement, finally come forward and seek help. Not only did he achieve greatness in his career, he also has the ability to become a role model and spokesperson for literacy. Thanks to all for their perspectives on the issue of literacy. I learned quite a bit, and many of these comments have given me pause in my attitudes toward those who never learned to read. I am a little embarrassed to admit that I have had disdain for those who were illiterate. Now I know better. What an inspiring story. It's great that Demers was brave enough to admit his lack and took the steps he had to. That story about the Cambodian woman was strange. Interesting, but strange. I like this - nonsense meme with serious stuff too. There have been a few long lost/kidnapping stories lately. It's all a bit disturbing. TRAVIS: I think the disdain is not unusual. But I also think we all need to look at each situation as unique. TOPCHAMP: I have been very busy also and I agree it is disturbing. I know of some who can't read...I wish they would be brave and ask for help without fear of put down. How can we make them feel strong enough to want to better themselves? Meredith Baxter-Birney as "The Jungle Lady" coming this March on Lifetime. The intelligence level needed to go through life and succeed at such high profile careers and keep it from the world speaks volumes about our beloved Coach Demers. It's a problem that is far more prevalent than many would like to believe. Well said Coco, and thank you Vince for exposing more people to a story that .. yes.. you were right.. some of us already knew about.